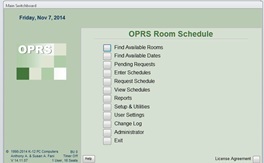 OPRS Room Schedule is a stand-alone application for creating calendars of events. This application is network ready and has features that allow network users to view and request schedules. The database administrator can limit access to creating schedules, using utilities and printing reports to those that are responsible for maintaining the calendar. Scheduling events often involves the reservation of space on the property or off site. OPRS Room Schedule is designed to provide a flexible method of booking time for gatherings both at the parish facilities as well as off-site gatherings that affect groups from the parish. We can customize uploads to web calendars. Copyright © 2017 Our Parish Record Systems All Rights Reserved.